I admit I've never completed the total Utah Shop Hop experience. 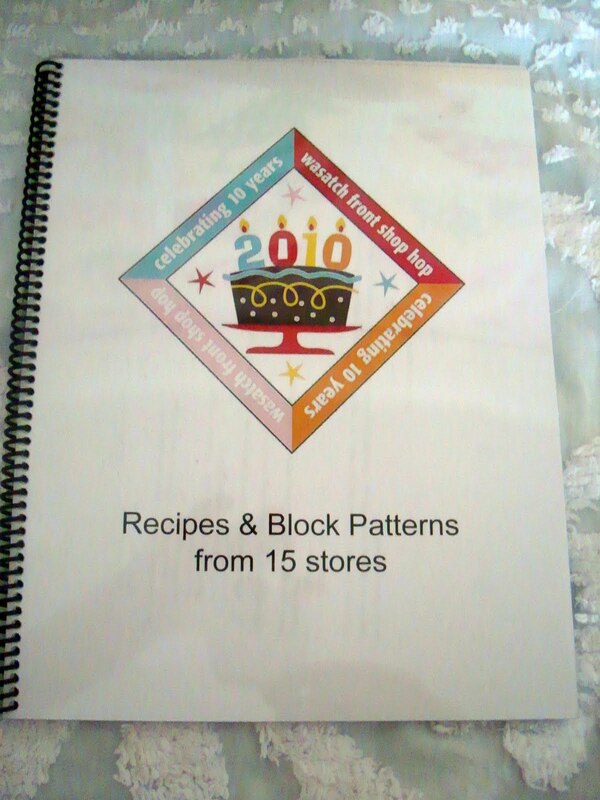 Usually I try to hit a few stores over the 4 days of Shop Hop. This year it just seemed so strange to have cooler weather (and wind). Usually Shop Hop is hot hot hot. The 3 stores I did go to (so far) were hot hot hot and it was fun to go with my BFF Lori Holt . . . Yes, that's us. Lori is on the left and I'm on the right. 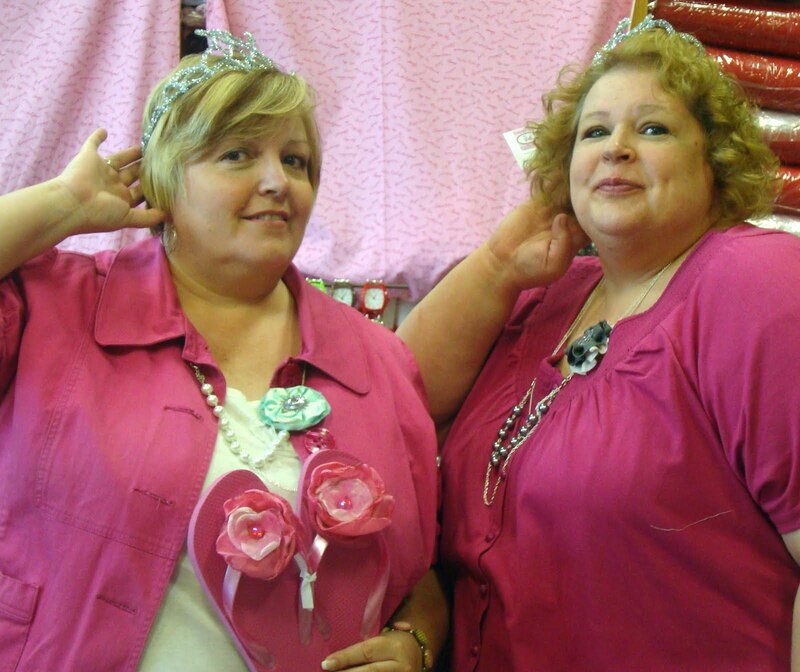 We are posing in our crowns that Material Girls gave out to celebrate Mother's Day, or Queen for a Day as we called it. Each store has a theme for an "event". Whenever Lori and I get together we have an awesome (I hardly ever use that word, so for emphasis you know I mean it) time together. Today was no exception. 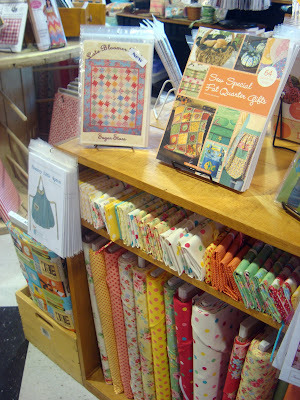 We went first to Material Girls, then Quilts in Sandy and then Pine Needles in Gardner Village. Lori and I have extremely tight schedules so we have to plan time together. I took some random shop pictures. I love the eye candy. All the stores had so many wonderful quilts and inspirational displays. It was just so fantastic. Flower Sugar II is quickly being sold at Material Girls. You can see Pam's pattern displayed right with the fabric. 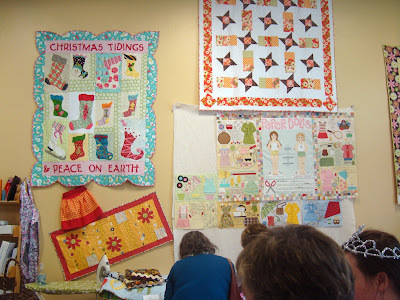 Here is Lori's Paper Doll Quilt in progress on the back wall. Lori teaches at Material Girls and it is sorta her 2nd home. I love the high ceilings at Material Girls. There is so much to look at. 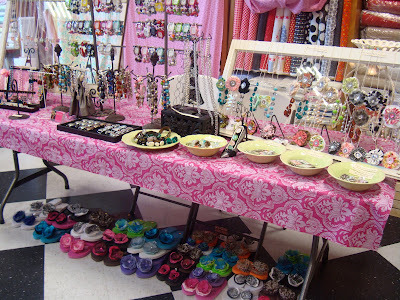 Lori's niece was there selling jewelry and cute decorated flip flops. If you check out the photo of me and Lori you can see we are modeling our necklaces. It is vintage cute. Lori gave me this darling gift. She is just so incredibly talented and genius really. I love love love this pincushion. I had it in my sewing room and my daughter said "that is the cutest pincushion I've ever seen". And she's right. It is going to sit right next to me at my machine. Thanks Lori. My Internet connection has been terrible lately. So I'll try to post again tomorrow. 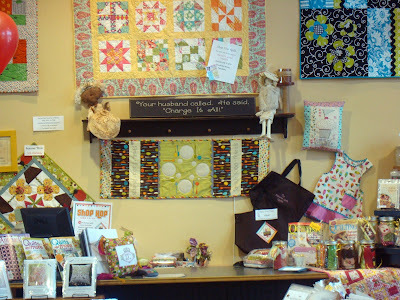 I want to show you the other shops we visited and maybe I'll get to Broadbent's and Quilting Cottage this week to show you those shops, too. We had a blast today and visited 10 shops. We didn't hit Material Girls until the afternoon. Sorry we missed both of you. Look at the two of you girls in your pink outfits!! I am so glad you had a fun day together. Now you know I want to see what you purchased!! I went today, too. I saw your cute bag pattern at Broadbents. I had 3 of my girls with me, so I gave them my crown from Material Girls. I loved all the displays they had. It was WAY crowded when I got there. We are going again tomorrow, but I don't think I will hit all of them this year. 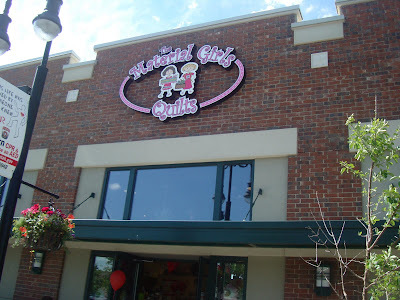 Utah has the best quilt shops. First...you two look like you're having too much fun...second...love the pink...and the crowns! What a fun shop hop...I happened upon it accidentally one year (just one shop)...and one of these days plan to attend! How fun that you two went together for Shop Hop! You and Lori look so cute in that first picture. Actually, you look like sisters. Truely, you are both Queens.
" 'cause girls just wanna have fun" - love the tiaras! Two pink princesses or should I say queens of the quilting world because you're both so talented, not to mention famous! I'll be watching out to see if you post your loot. You both match and are wearing my favorite color! Wow, it looks like you both had a fantastic time!! Great shops. Would love to see what finds you picked up! Ooooh, I'm soooo jealous!!! You girlies are so cute -- and so lucky! Looks like you had a great time and I LOVE that cute pincushion! Where on earth did Lori find that adorable little chair??? WooHoo, I'm having a virtual fun time with you guys!! Keep the posts coming! Looks like a ton of fun. I spent the day at youth conference. Fun, just a different kind. of course, you won a prize. you always win because you are a winner. and a queen-y winner to boot! yeah, it's usually so stinkin' hot. that would have been refreshing for me this year. hope to make it next year. You two look like you are having the best time! What a great outing. I have to wait six months at a time before I have someone to quilt shop with (when my sister and SIL are here in CA). 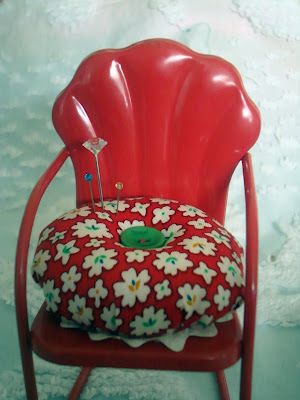 I love love love that pincushion too! What a fun time you looked like you had!! I love shop hops with a good friend. Darling pinchusion....does she sell them? What a delicious looking bunch of eye candy! Thanks for sharing. Looks like you two had a lot of fun. The pincushion is adorable! what a fun day to hangout with a friend!! I totally saw you at Material Grils, and I was there picking out fabric for your In the Lefy Treetops Quilt, but I was just too star struck to say anything. That is one of the cutest pincushions! I love shop hops and love seeing photos of shops. Thanks for sharing! Thanks for stopping by!! One of these days I am going to do the "Shop Hop" with you guys. I am glad you guys had fun!! The crowns look fantastic! I was glad to see Material Girls was in the Shop Hop!! Looks wonderful! What wonderful shops!! Nanette, thank you so much for taking the time to allow us to vicariously Shop Hop with you.